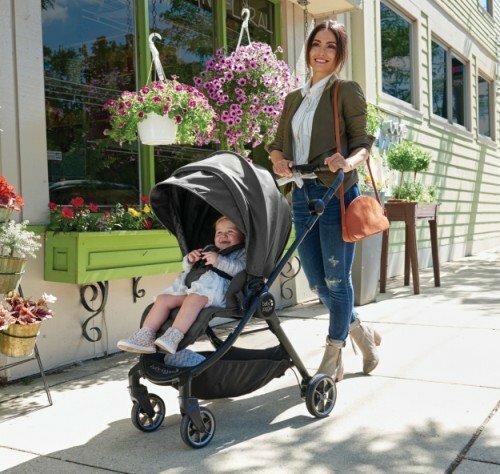 Baby Jogger City Tour LUX - Stroller For Travel Or Everyday Use? Baby Jogger City Tour LUX is a stylish and innovative stroller: lightweight, compact, multi-functional and suitable for newborn. And it is finally on the market! Baby Jogger has upgraded the City Tour to LUX version by adding few useful and versatile features that parents were asking for. The regular City Tour is an awesome stroller, perfect for travel by plane, but it can be used only for child who can sit unassisted (around 6 months). Many parents complained about lack of infant car seat compatibility and lack of possibility to use this stroller for newborns (you can read more about it here). 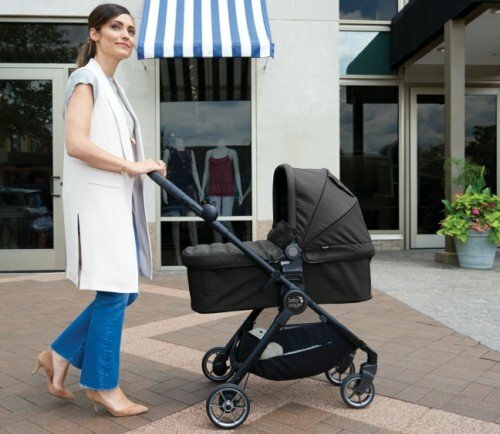 The new model – Baby Jogger City Tour LUX has all that features that we were waiting for! Every parent who appreciate combination of minimalism, functionality and modern design will love this stroller. Here is my Baby Jogger City Tour LUX Review with all information you need to know before you decide to buy it Find out if this stroller is worth the money if it is right for you and your little bundle of joy. 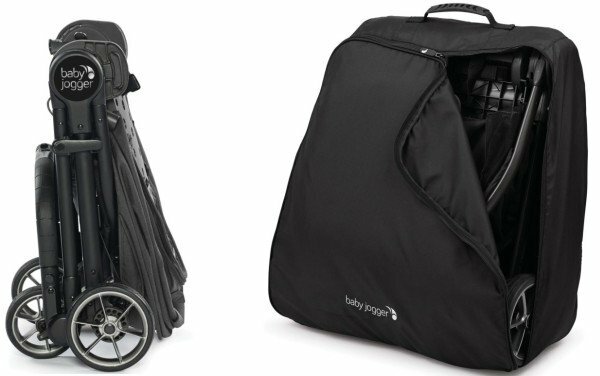 Compatible with infant car seats and newborn carrycot – now you can have 3-in-1 lightweight travel system! Option of attaching a board for older sibling! 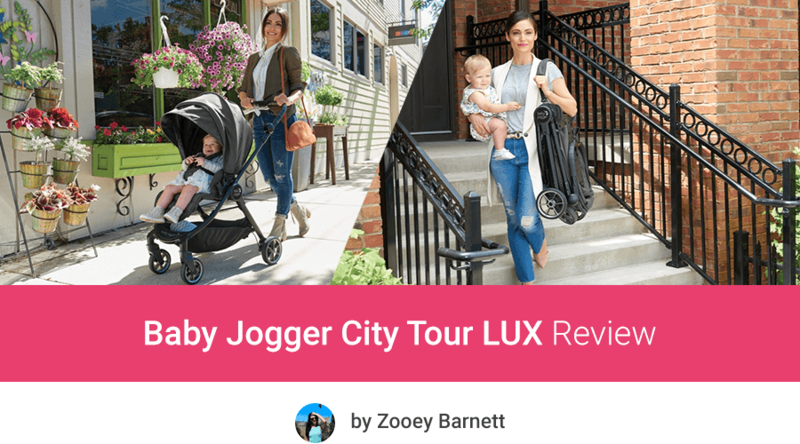 What other parents think about Baby Jogger City Tour LUX? 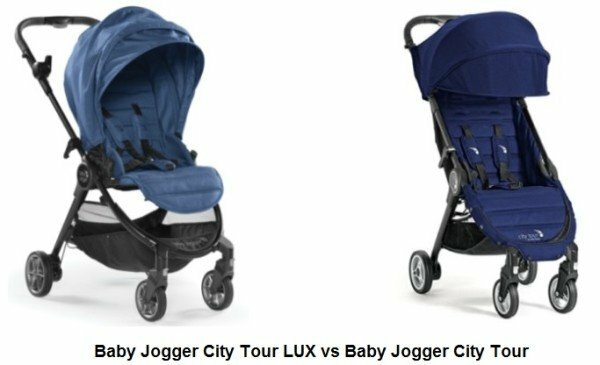 What features has the new model City Tour LUX 2018 from Baby Jogger? It is very different from previous model of City Tour stroller. Older version of Baby Jogger City Tour is equipped only with a toddler seat, suitable from 6 months and there is no seating option for newborns, since the stroller isn’t compatible with infant car seats and carrycot. The upgraded model – City Tour LUX is the manufacturer answer to customers complaints and requests. It will have much more seating combinations. The regular, toddler seat is nicely padded and multi-position recline with near-flat position (it’s not completely flat, it’s still few degrees reclined). I really like that we can easily lower or raise the seat with just one hand by using a lever. There is also adjustable leg rest for better baby’s comfort, which also is one-handed. The seat can go in both directions so the baby can face parents or the World. There is 5-point restrain with padding. This seat can hold a passenger from 3 months up to 45 lbs. What I really like about the toddler seat is that it’s much more roomy and deep than in original City Tour! Want to check all color versions and current price on Amazon? Here is Baby Jogger City Tour LUX in Granite, Iris, Slate and Rosewood. 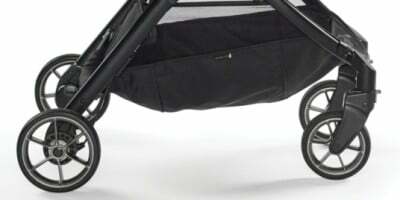 This new model offers a carrycot which can be attach to the frame. It provides fully flat position, suitable for younger babies. Thanks to it you can make the stroller suitable for your newborn baby. With the carrycot this is one of the smallest and lightest strollers that can be used since birth. What’s really great about this bassinet is that it folds with the stroller! You don’t have to remove it to fold your City Tour LUX. It’s very convenient and makes travel with newborn so much easier. Moreover you can fold this carrycot separately as well for more convenient storage for your next baby. I love this foldable bassinet! Thanks to this feature you can have a stroller with bassinet option, but it is much easier to store or transport than other prams. Keep in mind that the bassinet is sold separately (but it’s not very expensive). You can check its availability and price on Amazon by clicking here. It comes in four colors so you could match it with your City Tour LUX stroller. Yes! Baby Jogger City Tour LUX is compatible with infant car seats! That was the main parents complaint about the older model (regular City Tour) which doesn’t work with car seats. Now you can easily remove the regular seat, click the infant car seat onto the stroller frame and you’re ready to go. It’s very useful for parents who often drive or want to run some quick errands or go shopping with their newborn baby. Thanks to new options for newborns and infants (carrycot and car seats) City Tour LUX can be used from birth. Finally this excellent light stroller is also suitable for smaller and younger babies and makes travel with an infant more easy and enjoyable. With Baby Jogger City Tour LUX 2018 you can make a room for your other, older child. There is an option of attaching Glider Board so your older child can also have a ride in City Tour LUX! You can check how this board works and how much it costs on Amazon here. I really like that this stroller has option for the second child – it’s perfect solution for parents who have kids of different age, one of whom is older toddler or preschooler. This stroller has awesome huge 3-panel canopy with flip out sun visor. The canopy is not only roomy – giving baby a lot of space to grow, but also provides great shade from the sun. Protects baby from UV rays and wind. It’s bigger than the canopy on original City Tour stroller. This canopy has also a peek-a-boo window that gives nice extra air-flow and allows parents to check on their baby during stroll. The window closes with magnets, so no noisy Velcro – yaay! The handlebar on City Tour LUX is similar to the City Select LUX handlebar – the grip has rubber rings which makes it more comfortable to operate and more durable than foam padding. However, the handlebar is unadjustable. There are four single wheels with polyurethane tires which are lightweight, yet very durable. Front wheels are pivoting to make the stroller more nimble. They can be also locked to increase stroller stability when going over more difficult terrain. Although the wheels are rather small, they roll really smoothly. There is all-wheel suspension which absorbs shocks to provide more comfortable ride and easier pushing. However, the wheels work the best for strolling in the mall and around the city, they are not all-terrain. This stroller can go over gravel or cobblestone but it will wobble a little bit. And since the tires are non-inflatable so don’t have to worry about punctures or pumping. As you can see this brake is different from bicycle handbrakes that are typical for jogging strollers. Under the seat there is a storage bin – it’s not the biggest one, but as for such a small and compact stroller it is sufficient. It can accommodate all your necessities – the weight limit is 15.4 lbs. In the rear part of the basket there is a zippered pocket where you can put your valuables or smaller items. There is one additional storage pocket on the back of the seat. It’s useful because you can keep there your essentials like phone and keys within reach. This new model is more heavy than the original City Tour which is understandable when we consider it has to hold a carrycot or infant car seat with a newborn baby. It has to be more strong to do that! It weighs about 19.4 lbs which is still very impressive and light enough for carry around. The new model, Baby Jogger City Tour LUX is not an umbrella stroller, it’s rather something between lightweight and full-sized stroller. I love that this stroller is so compact and light, yet really well equipped! The upgraded model – City Tour LUX folds up similar to the previous model. Folding is super easy, one-hand and takes few seconds. City Tour LUX features one of the easiest fold in the World! All thanks to patented folding mechanism. Once the stroller is folded it’s very compact and doesn’t take much space. Baby Jogger City Tour LUX folded dimensions are: 24 x 21 x 11 inches. However, this model is bigger than the previous version so it may not be approved as carry-on on all airlines. You should check specific regulations for the airline you choose to be sure. This stroller stands on its own when folded and features automatic lock which simplifies storage and transport. There is also a shoulder strap and a handle which are useful for carrying the stroller up and down the stairs or when you use the stroller for older kid who can walk but sometimes needs a break and want to ride in it. You can carry around the City Tour LUX almost effortlessly. 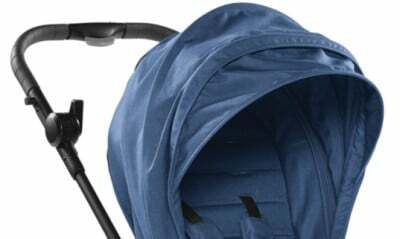 You can also put the folded stroller into a travel bag which has convenient backpack straps. This bag is also useful for storing the City Tour LUX. Big advantage is that bag is included in the stroller price. Here are the main features that, according to me, are the biggest advantages and disadvantages of this stroller. 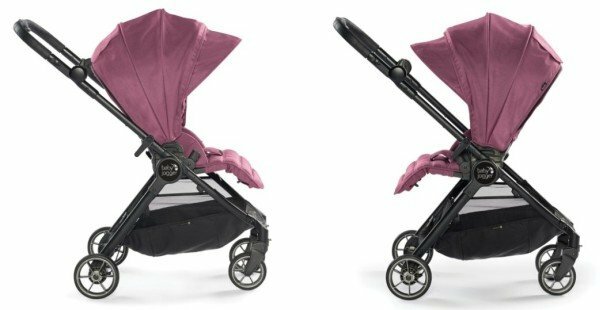 Baby Jogger City Tour LUX has just been released on the market and it is available for sale! The stroller comes with a carry bag which is a big advantage. To get the original product & full warranty you should buy it from an official seller, approved by Baby Jogger, for example on Amazon or PishPosh Baby. You can also check the current price and available discounts on Amazon for original Baby Jogger City Tour here. Here’s what I found out by reading customer reviews on Amazon. Parents love the reversible seat and near-flat recline which is very comfortable for sleeping baby. They also praise the fabric quality. Option of attaching the infant car seat, bassinet and Glider Board is very handy and parents like these functions. Another advantage is spacious storage basket. Most parents like the canopy – it provides good amount of shade in upright position, but when the seat is reclined the canopy is a bit too short to cover the baby. This stroller is easy to steer on sidewalks and streets and rolls pretty smoothly. It can go over short grass, but it’s not suitable for bumpy terrain (read more in this review). Folding takes few steps, but it’s not very difficult and can be done with one hand. Unfolding is a bit difficult, but few parents say it takes practice. As disadvantages parents mention: hard to use handbrake (read more here) and having to purchase the belly bar separately. One parent also complains about the stroller quality and customer support response time. If you’d ask me which model is better the original Baby Jogger City Tour or the new Baby Jogger City Tour LUX, I would say, it really depends on your needs. Both stroller are awesome, but have different features and different purpose. Regular City Tour is great lightweight travel stroller for toddlers. If your child is at least 6 months old and you’re plan on traveling with him, this is the perfect choice for you. However, this would be probably your second stroller, because for the first few months you will need a buggy that is suitable for newborns. The new City Tour LUX is more like a light everyday stroller which can serve you since infancy to toddlerhood. And it can be the only stroller you will ever need. It is also great for travel, nonetheless it is less likely that you could bring in on the airplane. Even if you can’t take it as carry-on it is still very useful for travel and perfect for road trips! The City Tour LUX is definitely awesome choice for parents who have small apartment and/or car with a small car trunk. It’s really nice to have such a light and compact stroller for everyday use. So the answer to the question “City Tour LUX or City Tour” depends on when and how you will use your stroller. If you want to read more about the original City Tour here is my in-depth review of this stroller. This new model rather won’t fit in overhead compartment on airplane (or at least not on every one), but it’s still useful stroller for travel with baby. 1. Since it has seating options for newborns, it can be the only stroller you will ever need. You won’t have to buy another stroller so you can actually save a lot of money! 2. The stroller with regular seat is much more compact and lightweight than other everyday strollers, yet it is really well-equipped. 3. This stroller is a space-saver, so it’s great choice for parents who have small cars or don’t have much free space at home. Before you purchase this stroller make sure to check available discounts and read customer reviews on Amazon. If this model doesn’t meet your needs, you can check out my ranking of other fantastic strollers this year! Can the seat color be changed? Can we purchase it separately? No, you can’t change the seat color. The toddler seat is not sold separately, only the bassinet is. So if you’re buying the stroller, you need to decide which color you like the most. The choice is vast, now there are 5 colors since they added the beautiful Ash to the lineup. Great review! My only concern about this stroller in the unadjustable handle bar. Both me and my partner are very tall (6ft and 6ft1) and we are wondering if the handlebar is not going to be too low for us? Thanks! The handlebar on City Tour LUX is about 39″ from the ground. It’s best for average in height person (closer to 5’5″), so it might be slightly too low for you. Hi, I was wondering if you know of any new car seats that are now compatible with the city tour lux? back in January you mentioned only Britax worked, has that changed? Hi Shirley! Yes, there are more car seats compatible with City Tour LUX. There are adapters for Britax, Chicco, Graco Click Connect, Maxi Cosi and Cybex 🙂 You can find them here on Amazon. 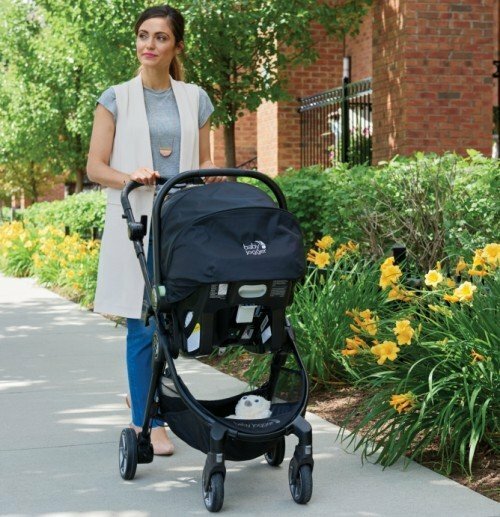 Is Babyjogger city tour lux compatible with Cybex cloud Q with adapter? Let’s start with the dimensions of the seats. Baby Jogger City Tour LUX seat is 10 inches wide, there are 19 inches from the bottom to the top of the backrest and about 22 inches from the seat bottom to the top of the canopy. UPPAbaby MINU seat is 13.2 inches wide and 9 inches deep the backrest is 18 inches long, there are about 25 inches to the top of the canopy. UPPAbaby G-LUXE seat is 13 inches wide, backrest is 20 inches long and there are about 27 inches to the top of the canopy. The seat bottom is also really deep – about 13 inches! So when it comes to seat size G-LUXE wins. As you can see each stroller has few inches above the top of the backrest to the top of the canopy which gives a baby more room to grow but it means a tall toddler or preschooler may have his head above the backrest. He will fit easily, but his head will be only partially supported (he probably won’t be able to take a nap). I think it’s not a big deal for a 3 or 4 year old kid, especially if you’re going to use this stroller in theme parks or at the mall, but I had to mention it 🙂 My 4 y.o. daughter doesn’t nap in a stroller anymore, but likes to ride in it sometimes when she gets tired on long distances or in a Disneyland and she doesn’t mind that her head is above the backrest. Of course seat size is not the only thing that you should consider. City Tour LUX doesn’t have a footrest so when the baby is taller his legs will dangle (he could even touch the wheels with his feet which is not good). G-LUXE offers a footrest, MINU also has a small flat part where taller baby can rest his feet on. Another thing is the weight and fold. City Tour LUX is the heaviest model out of these three strollers. It weighs 19 lbs, while MINU is only 14.8 lbs and G-LUXE weighs 16.3 lbs. Some parents complain City Tour LUX is a bit difficult to fold, but it’s a matter of practice. After folding is a quite compact package (24″ x 21″ x 11″). MINU is very easy to fold (with one hand) and folded dimensions are similar to City Tour LUX – it’s a flat package (11.5″ x 20.5″ x 23″). MINU is of course more easy to carry, because it’s much lighter. I think it’s very useful to have such a compact and lightweight stroller, because when you’re in a theme park and your kid wants to walk, you can easily fold the stroller and carry it on a shoulder (MINU has a strap) without any problems. G-LUXE has completely different fold – umbrella type – which is quite compact as well, but much longer (19.2″L x 12″W x 41.7″H). It includes shoulder strap. To be honest, I’m not a fan of this type of fold, it’s more difficult to carry (I always get dirty from the wheels). Other features are rather similar: small wheels with suspension which are good for sidewalks, hard-packed gravel, short grass and cobblestone (but not for off-road trails), large canopies with good amount of shade and reclining seats. So depending on how important for you is the folding size, I would rather recommend you G-LUXE or MINU. City Tour LUX is great, but it weighs more and has smaller seat which is your case is the most important factor. Hi! The seat on the City Tour is about 8.5 inches deep and I’m aware that some parents say it’s very shallow while others say it’s comfy even for a 3 year old child. I think it depends on how big is your baby and if he sits all the way back to the backrest (you may want to watch this video and see how the baby sits in City Tour seat: https://www.youtube.com/watch?v=5_ZCy1QKPgM). If you are going to use this stroller only for travel it’s still worth considering. City Tour LUX has more roomy seat, but it is heavier (however 19 lbs is still very portable!) and it has bigger fold which may not fit in overhead compartment on some airplanes. If you plan on traveling by plane a lot, check if the dimensions meet the carry-on regulations for your airline. I saw your comparison to the City Mini which I am debating between with the City Tour Lux as well! My biggest requirement is that the stroller be lightweight and compact, which both are. You said that once Lux becomes available, you were going to try it out on different terrains. Have you had a chance to try that yet? Hello Isa! I’ve tried it on a short trip and it worked really great as a compact travel stroller. 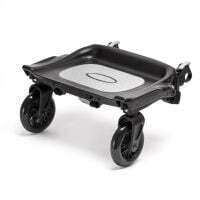 It has smaller wheels than City Mini (about 5”) and works best on smooth surfaces. Mine handled pavement, cracks on sidewalks and hard-packed dirt, but cobbled streets very more challenging. Thankfully City Tour Lux has suspension so it doesn’t wobble so much, but it’s not perfect for uneven terrain. If you’re looking for a well-equipped stroller for travel and short walks in the city it will be sufficient. If you like longer strolls or would like to stroll over more difficult terrain, go for the City Mini or even City Mini GT (it has all-terrain wheels). Hi ! does it comes with a car seat ? Hello! What car seats are compatible with this stroller? Do you know if the City Tour Lux will be available in Canada? How would you compare its maneuverability and ease of use to the Uppababy Minu? I’m a suburban mom with a small house and car. 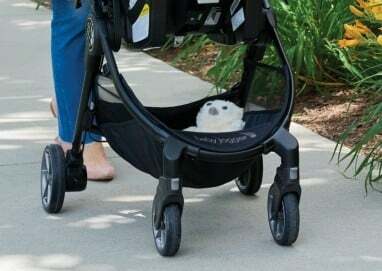 I want something that can be my one and only stroller. It’ll mostly be used on pavement for neighborhood walks, malls, sidewalks, and maybe occasionally a park. I haven’t had a chance to test both strollers outdoors to compare their maneuverability, but I will definitely do that when both models are available for sale. Generally speaking City Tour LUX and MINU have similar small wheel and suspension so they will be perfect for going over sidewalks, gravel in parks and indoor use like at the mall or airport. 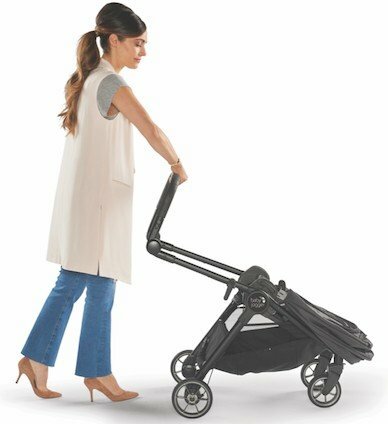 UPPAbaby MINU has more compact fold than City Tour LUX. It can be even folded with the bassinet (From Newborn Kit) attached therefore I would say it would work better for small house and small trunk. I also prefer MINU seat recline and the folding mechanism which is easier than in City Tour LUX. And the MINU is much lighter (about 5 lbs) and more portable. It’s perfect if you need to run some quick errands or go to grocery store, you can fold it in few seconds, throw into your car trunk – no matter if you use it with bassinet for your newborn baby or with regular seat. Hoe would you compare this to the popular City Mini? Hi Seanna! That’s very interesting comparison. At first glance City Tour LUX is a bit more compact than City Mini, but it is about 1 lbs heavier. Both strollers are designed for everyday use for urban parents but there are few difference. I would say the biggest difference is in switching between different seating options. -City Tour LUX seat is reversible which in my opinion is very useful, because I prefer when my baby is facing me during the first months so I can keep an eye on him the whole time, but when the baby gets older and more curious about the World it’s good to have an option of reversing the seat so the baby can face front and observe everything. City Mini doesn’t have reversible seat. -City Tour LUX has deeper recline and fully adjustable calf rest (you can see that in the picture above) and in my opinion the recline mechanism is better than in City Mini (there is a lever that you can use easily with one hand to lower and raise the seat, instead of straps and buckle). Also, in City Tour LUX the whole seat unit reclines, in City Mini only the back rest goes lower. -Both models have different wheels design – City Mini has three wheel design with dual front wheel (which gives strong foundation) while the City Tour LUX has four wheels. -City Tour LUX has definitely smaller storage basket than City Mini. -LUX has hand-operated parking brake, instead of a foot-operated brake; it will come with a shoulder strap and travel bag with backpack strap. -Folding is also different, in City Tour LUX it takes few steps but it is still very easy and quick. Folded LUX is smaller but not as flat as City Mini. When LUX becomes available I will try it on different terrains and compare it to the City Mini performance as well.